Beautiful nursery wall art commemorates a special day in a unique way. Every good and perfect gift is from above. 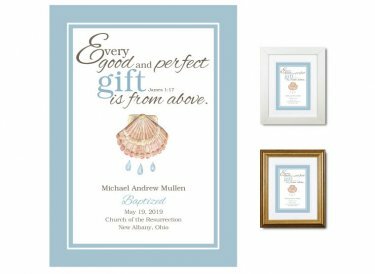 The shell and water droplets, symbolizing baptism, are featured in the design. Makes a wonderful gift! It's personalized with the child's name, baptism date, church name and location. Original design. Hand finished using premium museum-quality materials. Also available in pink. Framed & Finished - Printed on premium paper with archival inks and double-matted with conservation-grade matboard as above; mounted using acid-free foam core backing; framed using distortion-free UV acrylic glazing. A protective dust cover and wall guards are applied to the back. Your choice of white or gold wood frame (view frames here); ready to hang. Finished size: 10"x12"